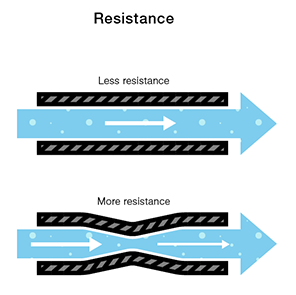 Resistance is a material's tendency to resist the flow of charge (current). So, when we talk about these values, we're really describing the movement of charge, and thus, the behavior of electrons. A circuit is a closed loop that allows charge to move from one place to another. 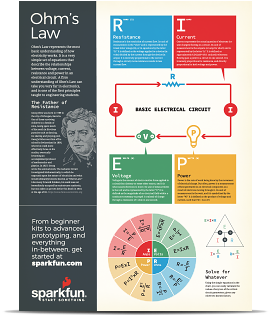 Components in the circuit allow us to control this charge and use it to do work. 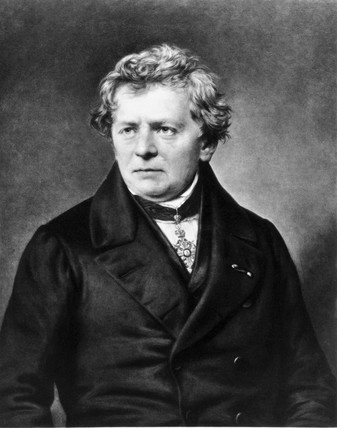 Georg Ohm was a Bavarian scientist who studied electricity. Ohm starts by describing a unit of resistance that is defined by current and voltage. So, let's start with voltage and go from there. We define voltage as the amount of potential energy between two points on a circuit. One point has more charge than another. This difference in charge between the two points is called voltage. It is measured in volts, which, technically, is the potential energy difference between two points that will impart one joule of energy per coulomb of charge that passes through it (don't panic if this makes no sense, all will be explained). The unit "volt" is named after the Italian physicist Alessandro Volta who invented what is considered the first chemical battery. Voltage is represented in equations and schematics by the letter "V". We can think of the amount of water flowing through the hose from the tank as current. The higher the pressure, the higher the flow, and vice-versa. With water, we would measure the volume of the water flowing through the hose over a certain period of time. With electricity, we measure the amount of charge flowing through the circuit over a period of time. 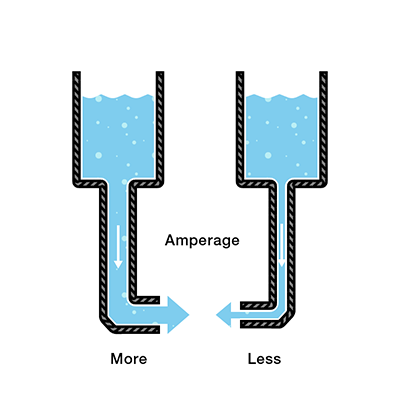 Current is measured in Amperes (usually just referred to as "Amps"). An ampere is defined as 6.241*10^18 electrons (1 Coulomb) per second passing through a point in a circuit. Amps are represented in equations by the letter "I". Let's say now that we have two tanks, each with a hose coming from the bottom. Each tank has the exact same amount of water, but the hose on one tank is narrower than the hose on the other. This brings us back to Georg Ohm. Ohm defines the unit of resistance of "1 Ohm" as the resistance between two points in a conductor where the application of 1 volt will push 1 ampere, or 6.241×10^18 electrons. This value is usually represented in schematics with the greek letter "&ohm;", which is called omega, and pronounced "ohm". Let's say this represents our tank with a wide hose. 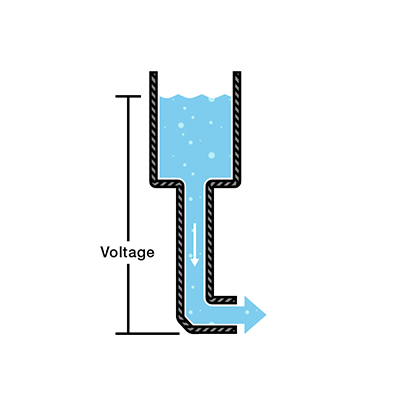 The amount of water in the tank is defined as 1 volt and the "narrowness" (resistance to flow) of the hose is defined as 1 ohm. 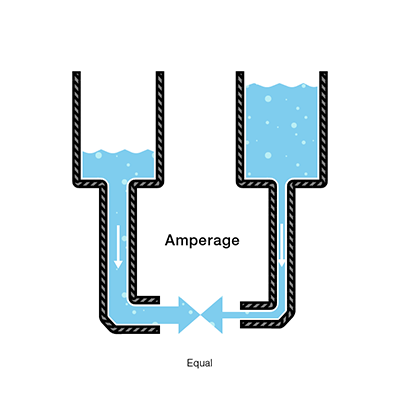 Using Ohms Law, this gives us a flow (current) of 1 amp. So, the current is lower in the tank with higher resistance. Now we can see that if we know two of the values for Ohm's law, we can solve for the third. Let's demonstrate this with an experiment. For this experiment, we want to use a 9 volt battery to power an LED. LEDs are fragile and can only have a certain amount of current flowing through them before they burn out. In the documentation for an LED, there will always be a "current rating". This is the maximum amount of current that can flow through the particular LED before it burns out. NOTE: LEDs are what's known as a "non-ohmic" devices. This means that the equation for the current flowing through the LED itself is not as simple as V=IR. The LED introduces something called a "voltage drop" into the circuit, thus changing the amount of current running through it. However, in this experiment we are simply trying to protect the LED from over-current, so we will neglect the current characteristics of the LED and choose the resistor value using Ohm's Law in order to be sure that the current through the LED is safely under 20mA. 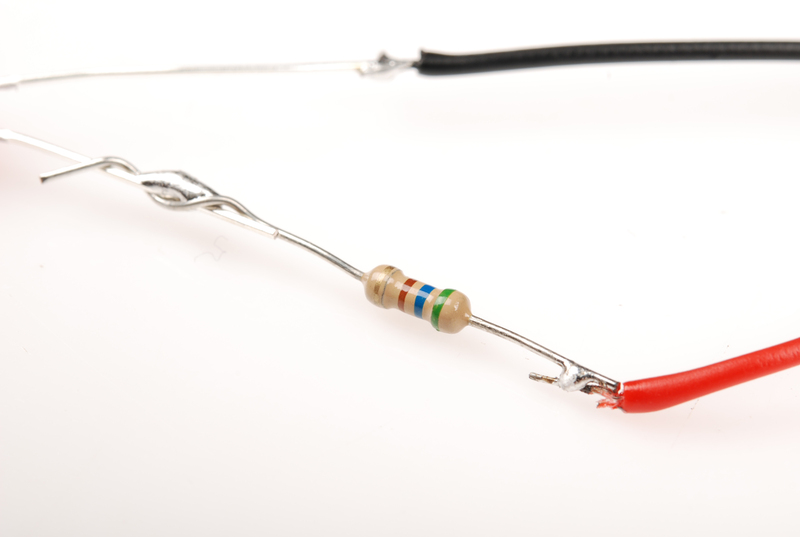 500 ohms is not a common value for off-the-shelf resistors, so this device uses a 560 ohm resistor in its place. Here's what our device looks like all put together. Success! We've chosen a resistor value that is high enough to keep the current through the LED below its maximum rating, but low enough that the current is sufficient to keep the LED nice and bright. 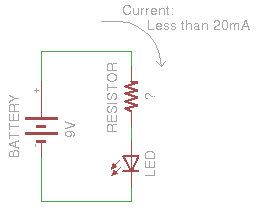 This LED/current-limiting resistor example is a common occurrence in hobby electronics. 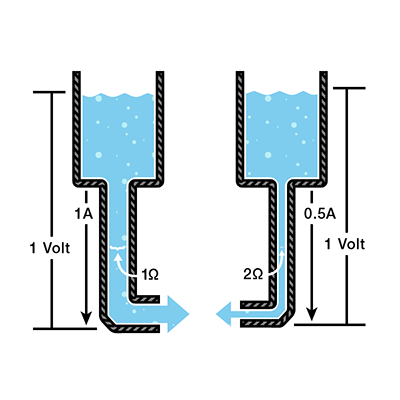 You'll often need to use Ohm's Law to change the amount of current flowing through the circuit. Another example of this implementation is seen in the LilyPad LED boards. Current Limiting Before or After the LED? To make things a little more complicated, you can place the current limiting resistor on either side of the LED, and it will work just the same! Many folks learning electronics for the first time struggle with the idea that a current limiting resistor can live on either side of the LED and the circuit will still function as usual. Imagine a river in a continuous loop, an infinite, circular, flowing river. If we were to place a dam in it, the entire river would stop flowing, not just one side. Now imagine we place a water wheel in the river which slows the flow of the river. It wouldn't matter where in the circle the water wheel is placed, it will still slow the flow on the entire river. This is an oversimplification, as the current limiting resistor cannot be placed anywhere in the circuit; it can be placed on either side of the LED to perform its function. For a more scientific answer, we turn to Kirchoff's Voltage Law. It is because of this law that the current limiting resistor can go on either side of the LED and still have the same effect. For more info and some practice problems using KVL, visit this website. These concepts are just the tip of the iceberg. If you're looking to study further into more complex applications of Ohm's Law and the design of electrical circuits, be sure to check out the following tutorials.